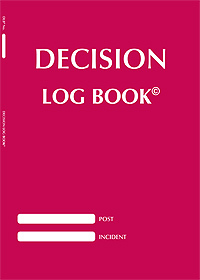 The Decision Log Book© fills the need for a definitive record for all senior decision making staff involved in emergency duties. Designed for individual post holders, groups using the National Command and control structures, it allows a legal record to be created for future reference. This enables an organisation to fulfil its obligation to have a record of information received and decisions made during a period of a duty or for a more protracted and complex emergency incident, information for which may be contained within a number of books. Designed for any collaborative decision making group formed to handle an emergency, e.g. Chief Executives at NHS Gold / STAC level, Military decision makers, Accident Investigators, Local Authority decision planners. Size: 297x210x6mm, Weight: 318g. Numbered book with sequentially numbered pages. Can fully record 10 separate decisions. Soft cover. When used for an individual post holder, the book can be a record for one individual, lasting days or weeks, depending on the issues resolved and the decisions made. It will be a personal record, siomilar to a police officer's pocket note book.. The information on a larger complex incident may be contained within a number of DLBs. Consider using the DLB in conjuntion with other CWC Services' log books and the Cruciform® Emergency Documentation System. In the UK, Hospital Trusts and Ambulance Services now use CWC Services log books for their on call and emergency response. The Health Protection Agency, Environment Agency, PCT's and a number of major hospitals also equip their managerial and on call staff with the systems. A number of UK Local Authorities are also starting to use CWC produced log books. Some Fire and Rescue Services are also using the Decision Log Book©, including the Fire Service Training College at Morton in the Marsh. The DLB© should be used for any emergency duty, role or for an incident, particularly where several agencies are involved. The DLB© can be used at any level, Gold, Silver, Bronze, to record collective decision making and the associated process. The DLB© may also be used by an individual in a command role who may be required to record their decision making and associated processes. For an incident, the DLB© will be a record for an incident manager during the period of an incident. Several managers might use the same book during the incident, particularly if the incident lasts over a period of time. Ambulance service duty managers and duty managers from other emergency services would find the book helpful as a record for the oncoming duty manager of what actions or organisational changes has been decided during the previous duty time. The entry number (sequentially from 1 – n) can be used to mark any other document which relates to that entr within the DLB©. This could be emails, phone messages or other documents. This enables a subsequent analysis to be accurately carried out. If one DLB© used for an incident is used up, the sequel book should start with the n+1 entry number. The number of the sequel book should be entered on the last page. All entries should be initialled to ensure an accurate and complete record. The book can be filled in by a “logger” or administrative assistant, but the role holder or incident manager must initial each entry to signify that it accurately reflects the information received and decision taken. The DLB© will form part of the organisation’s record of an individual’s or multi-disciplinary teams’ decisions. As such it will be securely held for a minimum of 25 years after the end of the incident or after the book is filled. The unique number of the DLB© will enable any specific book to be filed and retrieved should any query be raised about an individual’s, role holder’s, incident manager’s or organisational decision making group’s actions during the period in question.